28.06.2018 28.06.2018 ~ Trần Đình Hoành	~ Bạn nghĩ gì về bài viết này? 20.08.2017 20.08.2017 ~ Đào Thu Hằng	~ Bạn nghĩ gì về bài viết này? 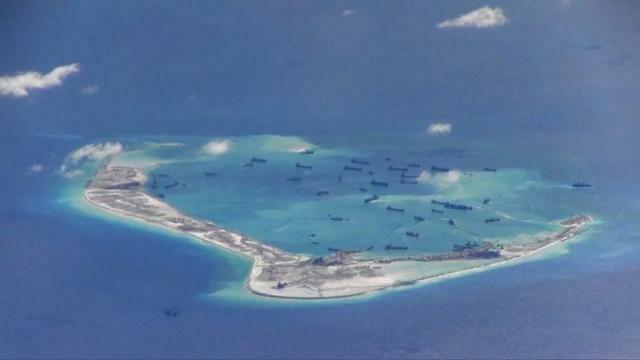 Vox_Since 2014, China has been building islands in the middle of the South China Sea. What were once underwater reefs are now sandy islands complete with airfields, roads, buildings, and missile systems. In less than two years, China has turned seven reefs into seven military bases in the South China Sea, one of the most contentious bodies of water in the world. The sea is one of the most important areas of ocean in the world. It’s estimated to hold 11 billion barrels of oil, 109 trillion cubic feet of natural gas, and 10 percent of the world’s fisheries. Most importantly, 30 percent of the world’s shipping trade flows through the South China Sea to the busy ports of Southeast Asia. It’s an incredibly important strategic area, and five countries currently claim some part of it. href=””>United Nations Law of the Seas, which says a country’s territory extends 200 miles off its shores, an area called the exclusive economic zone, or EEZ. Any trade or resources that fall in a country’s EEZ belong to that country; they’re its sovereign territory. Any area that is not in an EEZ is considered international waters and subject to UN maritime law, meaning it’s shared by everyone. Every country in the region, which includes Malaysia, the Philippines, Brunei, and Vietnam, bases its claim to the South China Sea on the UN’s EEZ laws — except China. China argues it has a historical claim to the South China Sea, dating back to naval expeditions in the 15th century. After World War II, the Japanese Empire lost control of the South China Sea, and China took advantage of the moment to reclaim it. On maps, it started drawing a dashed line that encompassed most of the South China Sea. This line became its official claim and is known today as the Nine-Dash Line, because it always has nine dashes. In 1973, when the UN law established EEZs, China reaffirmed its Nine-Dash Line, refusing to clarify the line’s boundaries and rejecting other countries’ claims. Since then, tensions have built around who rightfully owns the South China Sea. The dispute has centered on the Spratly Islands, an archipelago at the heart of the South China Sea. Currently, China, Malaysia, the Philippines, and Vietnam claim some part of the Spratly Island chain. They’ve asserted their claims by putting small buildings, ports, and even some people on what are essentially rocks in the middle of the ocean. But the Spratlys are very important, because whichever country can successfully claim them can extend its EEZ to include them, thus gaining miles of precious sovereign territory. This is why China began building up islands in 2014. By turning these rocks into military bases, the Chinese are now able to support hundreds of ships, bolstering their presence in the region. They are using fishing boats, surveillance ships, and navy destroyers to set up blockades around other countries’ islands and defend their own. This is all done very cautiously and in small steps in order to avoid sparking a wider conflict. Since China began building islands, the disputes have not become violent. But tensions are building in the region. As China deploys more of its military to the Spratlys, other countries are getting nervous and building up their own islands. It’s a complex situation that will continue to gain international attention, for better or for worse. 09.07.2016 ~ Trần Đình Hoành	~ Bạn nghĩ gì về bài viết này? chathamhouse – Despite its dramatic rejection of the South China Sea arbitration case initiated by the Philippines, China is gearing up to play a much larger role in the evolution of the international legal system. A vendor in Beijing stands behind a map including an insert depicting the ‘nine-dash line’ in the South China Sea. Photo by Getty Images. It is tempting to read China’s refusal in this case to acknowledge the jurisdiction of the arbitral tribunal in The Hague as the defiance of an arrogant superpower that views itself as above international law. No doubt many in Manila, Washington and elsewhere are purveying this view. But there is more here than meets the eye. 16.05.2016 ~ Trần Đình Hoành	~ Bạn nghĩ gì về bài viết này? 02.05.2016 02.05.2016 ~ Trần Đình Hoành	~ Bạn nghĩ gì về bài viết này? 18.03.2016 ~ Trần Đình Hoành	~ Bạn nghĩ gì về bài viết này? 25.02.2016 25.02.2016 ~ Trần Đình Hoành	~ Bạn nghĩ gì về bài viết này? 04.02.2016 04.02.2016 ~ Trần Đình Hoành	~ Bạn nghĩ gì về bài viết này? 18.12.2015 ~ Trần Đình Hoành	~ Bạn nghĩ gì về bài viết này? A Case of Rocks or Islands? A Return to the Rule of Law in the South China Sea? 13.11.2015 ~ Đào Thu Hằng	~ Bạn nghĩ gì về bài viết này? The UNCLOS tribunal’s ruling that it has jurisdiction in the case brought by the Philippines will likely improve prospects for the rule of law in the South China Sea – and it is in China’s interest to contribute to this development. DigitalGlobe high-resolution imagery of the Subi Reef in the South China Sea. Photo via Getty Images. 12.11.2015 ~ Đào Thu Hằng	~ Bạn nghĩ gì về bài viết này? From November 14-22, President Obama will embark on a three-stop overseas trip, beginning in Turkey to attend the G20, followed by a stop in Manila for the APEC summit, and ending in Malaysia where he will meet with Asian leaders for the 10th East Asian Summit (EAS) and U.S.-ASEAN Summit. 27.08.2015 ~ Trần Đình Hoành	~ Bạn nghĩ gì về bài viết này? 26.08.2015 ~ Trần Đình Hoành	~ Bạn nghĩ gì về bài viết này?